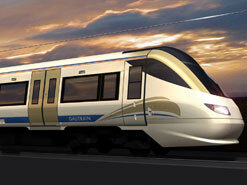 Artist’s impression of the sleek Gautrain. a model of the Gautrain. 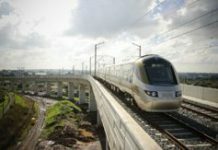 South Africa’s public rail transport system is undergoing an extensive revamp, and one of the most talked-about projects is the multi-billion-rand Gautrain Rapid Rail Link. 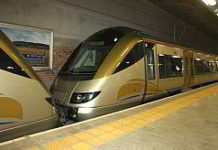 The fast train will travel the 80 km distance between Pretoria and Johannesburg in less than 40 minutes, at a speed of 160 km per hour. 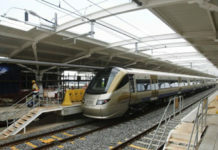 The latest announcement from the Gautrain team is that a section of the route will become operational just in time for the Fifa World Cup, which kicks off on 11 June 2010 with the final taking place exactly a month later. Just two weeks before the long-awaited event, a stretch of the route between OR Tambo International Airport and the Sandton station, including two stations in between and the Midrand operations centre, will be opened. This constitutes the first phase of the development, according to the latest construction update on the Gautrain website. Construction of this phase is scheduled to last 45 months. This will be a crucial segment of the route in World Cup terms, as the majority of football fans visiting the country will enter through OR Tambo airport and disperse to their hotels and guesthouses. However, the second phase, also under construction at the moment, will take nine months longer and is only due for completion in 2011. This section includes the route from Sandton into Johannesburg central, and the Pretoria to Midrand portion of the network. The R20 billion (about $2.5 billion) Gautrain has two major branches, one running north/south between Johannesburg and Pretoria, and one running east/west between the business district of Sandton and OR Tambo International. Apart from the three main stations of Johannesburg, OR Tambo and Pretoria, there are another seven stations along the way. Three stations will be underground, four will be at ground level, and the remaining three will be elevated. 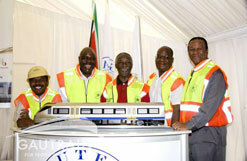 Construction on the Gautrain began in September 2006. But the arrival of a custom-built tunnel-boring machine towards the end of 2007 has given extra impetus to work on the project. The 325-ton machine, nicknamed Imbokodo (Zulu, meaning rock), and its 560 tons of backup equipment, was commissioned and specially built over a 12-month period in Germany, at a cost of R300 million. Imbokodo is the stone that African women use to grind maize, but it also refers to the struggle song sung by 20 000 heroic women in August 1956 as they marched to the Union Buildings to protest against the apartheid pass laws of the time. “Wathint’ abafazi, wathint’ imbokodo” – “If you strike the women, you strike a rock”. The Gautrain will travel on the surface and over a number of viaducts – sections of track on multi-spanned bridges – for most of its journey but will descend underground for 15 km between the Marlboro and Johannesburg stations. Most of the tunnel excavation is done using traditional drilling and blasting as used on mines, except for a 3 km stretch of soft rock and waterlogged soil being tackled by Imbokodo. The tunnel-boring machine began work on the tunnel in the Rosebank section of the route, north of Johannesburg, in January 2008 and at the time of writing had already progressed about 1 190 metres underground. Not only does Imbokodo chew up the ground in front of it, but it also smoothly installs pre-cast sections of concrete behind it, which serve as the tunnel’s watertight lining. The machine, which requires 3.2 MW of power to drive it, has its own electricity substation. Meanwhile, work continues above ground at all stations and on viaducts. The Gautrain project has drawn many comments, both positive and negative, and its cost remains a hot topic of conversation and debate. However, not only will the train alleviate pressure on the busy stretch of highway between Pretoria and Johannesburg by ferrying up to 120 000 passengers per year, but it has also alleviated a situation of poverty for many. Gauteng Premier Mbhazima Shilowa, speaking at the commissioning of the impressive tunnel-boring machine in December 2007, said, “We have created more than 5 400 direct jobs, with about 3 000 being historically disadvantaged people. It is estimated that the project will have sustained and/or created more than 29 400 direct, indirect and induced jobs by the end of the 2007/08 financial year. Additionally, travel between Johannesburg and OR Tambo, Africa’s busiest airport, will take on new levels of efficiency. Passengers will check their baggage in at Sandton station and be whisked in less than 15 minutes to a station beneath the airport terminal. This, too, is expected to impact positively on business. Much of the debate around Gautrain concerns the ever-increasing cost of the project. When it was first announced in 2000 the cost was reported as around R4 billion. Three years later it was reported as R7 billion, and in 2005 a figure of R20 billion was announced. 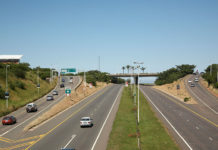 However, in March 2008 in the National Assembly, Jeremy Cronin of the South African Communist Party expressed fears of an even more inflated figure of R35 billion, which was later revised to R29 billion. This has subsequently been denied by Gautrain management and, says Gautrain Management Agency CEO Jack van der Merwe, the final cost of R25.2 billion is fixed. Construction updates are posted on a monthly basis on the Gautrain website for those interested in following its progress.